A funeral home in Nebraska was having trouble finding relatives for Stanley C. Stoltz and invited the public to attend his service. A 73-year-old Vietnam veteran's funeral drew hundreds of people, including apparently many who did not know him, after a funeral home that could not track down his family posted an online obituary inviting the community to attend. 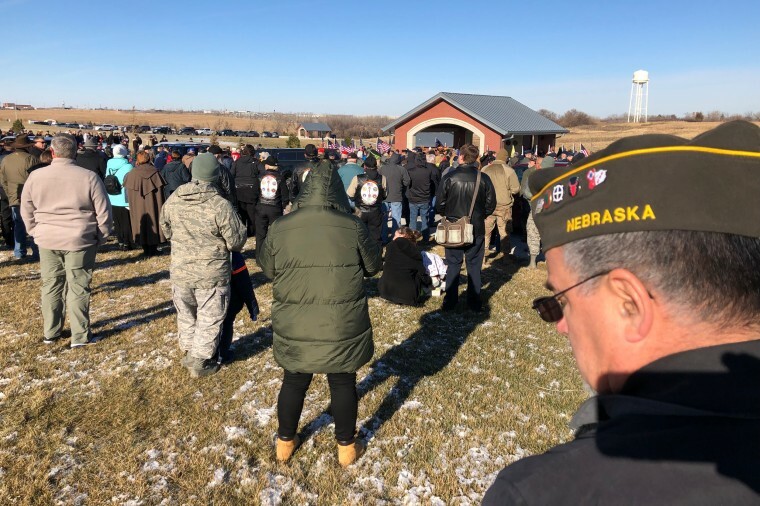 Photos and video taken outside the Omaha National Cemetery in Nebraska showed a long line of cars parked outside the burial ground and people huddled together outside. One picture showed Stanley C. Stoltz's silver casket lined with flowers and tiny American flags. The outpouring of support came after the Good Shepherd Funeral Home in Omaha posted an online obituary in the Omaha World-Herald inviting the community to attend the interment. "'The Public is invited to the Cemetery to honor a Vietnam Veteran with no known family," the obituary read, announcing Stoltz's Nov. 18 death and funeral arrangements. After Stoltz's funeral announcement went viral, people vowed to attend so he wouldn't be alone. 'It will be my honor to attend your funeral service today! You have served our country with Honor, Courage and Commitment during the Vietnam Era! We SALUTE YOU and THANK YOU for your service and sacrifice! You are not forgotten! May God bless you in His Heavenly Kingdom," one man named Jeff Conrad wrote on Stoltz's online obituary. Others thanked Stoltz for serving the country. "I did not know you but your story is being told. Thank you for your service. Thank you for doing what so many of us never could," Kelly Copeland posted. "I never knew the man. I didn't even know he existed until today," Jake Gissendanner wrote. "I honor his life for his service to our country. So many men and women pass without acknowledgement. They deserve it before, and they deserve it after. May he be with God now, enjoying heaven. When my time comes, I'll buy you a beer up there man!" The funeral director for Good Shepherd told NBC-affiliate WOWT that after news of the funeral announcement spread online, some of Stoltz's family members were located. Bill Bohn, the former mayor of Bennington, Nebraska, said he thinks Stoltz, born in May 1945, was drafted into the Vietnam War, according to the Omaha World-Herald. He was a private first class in the Army, the newspaper reported. Stoltz's first wife, Pamela Muhleka, died in 1984 from cancer, the outlet reports. He later remarried and divorced, but never had any children.